Your baby's first tooth is a big milestone! If you have noticed that your baby is teething, or you already have that first tooth, you may wonder when it becomes necessary to start brushing a baby's teeth. Do you start as soon as the first tooth erupts? When the baby starts eating solids? And how often should you brush your baby's teeth... and let's not forget about the kind of toothpaste you use? All dentists are clear on this issues a baby's teeth (or tooth!) should be brushed as soon as they erupt. Brushing a baby's teeth immediately keeps them healthy and clean, and may prevent early childhood caries. Baby teeth don't erupt completely all at once, though, and at first you will see some stubs. Those can be cleaned with gauze, and some dentists will tell you that it is not necessary to use toothpaste. 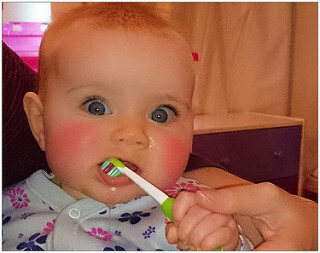 The toothbrush should be appropriate for infants, and be soft. Your baby's toothpaste should be sugar-free. Believe it or not, many kids' toothpastes actually contain a lot of sugar, which makes it contribute to decay rather than preventing it. The opinions on the use of fluoride are divided. Most dentists would not advocate using a fluoride toothpaste for infants, though. Some infant toothpastes, like Chicco's, contain xylitol a natural sugar which has been shown to prevent caries and help remineralize the teeth. You may like to look into this. While you are thinking about brushing your baby's teeth, you're probably in the thick of teething pain as well. If your baby's teething is hell for the whole family, consult your baby's pediatrician on teething remedies to ease the pain. Teething might just be the hardest thing about parenting a newborn, but you will get through it!